The traditional representation of a qubit - a quantum bit of information - is a sphere containing an arrow. The arrow's direction indicates the state of the qubit. 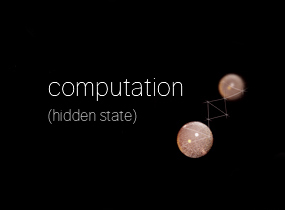 My representation illustrates the process by which quantum information remains secure over the course of a quantum computation. Input qubits have ill-defined states, as indicated by blurred arrows. Computing qubits are opaque. Their arrow direction is hidden and unknown. Output qubits have well defined states.